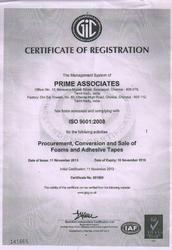 Established in the year 2003, we, "Prime Associates", are one of the formidable organization engaged in manufacturing & supplying of Adhesive Tapes. Our product range comprises of Nitto Products, Self Adhesive Tapes and 3M Products. With an eye on fulfilling the packaging needs of the industry, we have come up with a range of highly useful products. Our organization has established strong relations with the reputed vendors and manufacturers of the industry. This enable us to source premium quality products at highly competitive prices. Empowered by a diligent team of professionals, we have been able to offer quality tested products to the clients. We are acknowledged in the industry for offering effective after sales support and quality products. Our organization considers client satisfaction as the primary aim and has taken strict measures to ensure that in all our endeavors. With the introduction of easy payment modes, terms and well-knit distribution network, our organization has gained a hold over a huge client base. Under the leadership of our mentor, "Mr. Javerilal Lalwani", we have grown to become one of the celebrated organizations in the domain. It is due to his unwavering commitment towards offering quality products to the clients that has helped us achieve sky-rocketing success. Our success within few years of our inception can be attributed to the combined efforts of our professionals towards the completion of common objective. We are supported by an industrious team of qualified and skilled professionals, which is dedicatedly working towards offering incomparable products to the clients. Vendor base holds primary importance for a trading organization and hence, we take utmost care while selecting the vendors. Our procuring team is consistently engaged in searching for the authentic and trustworthy manufacturers of the industry. Our products are renowned in the market for various features like durability, reliability, high adhesion strength and moisture resistance. Owing to these features, our range is demanded in various industries. It is due to our dedication and commitment that we have earned accolade and laurels from our valuable clients.